The increasing pressure on engineering teams to do more with less is a key theme on this blog. Engineering work must be delivered faster, more efficiently, predictably, with less rework to capture value through improved profitability. In a fast changing world, business urgently requires engineering to deliver disciplined innovation to create new value for growth and increased competitiveness. Engineering leaders grapple with meeting these competing expectations on a day-to-day basis under tight capacity constraints. To succeed in today’s business environment engineering leaders must adopt a new delivery paradigm to do more with less. Lean engineering offers a proven paradigm change from traditional engineering. Traditional engineering seeks to maximize utilization, process large batch sizes, treats variability as bad (killing innovation), treats iteration as bad, and is blind to queues. Engineering delivery performance is poor in the traditional paradigm. 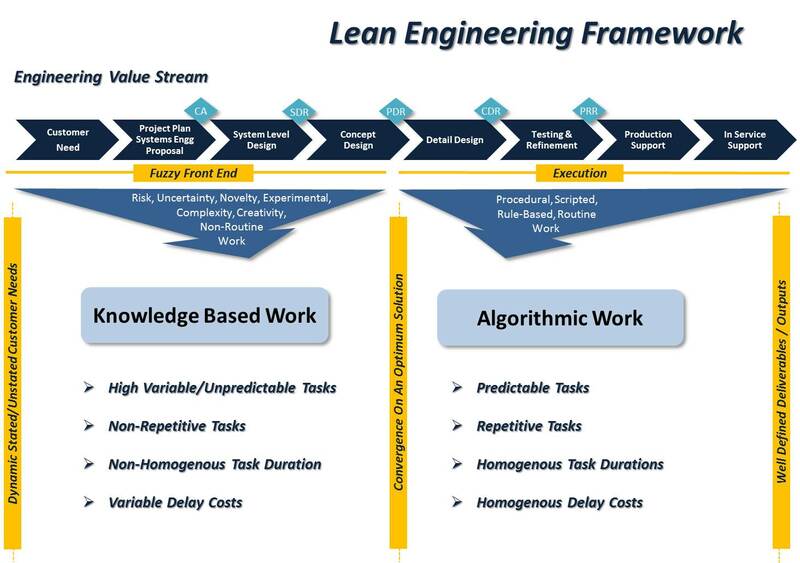 Lean engineering seeks to maximize throughput of the constrained engineering capacity, streamline value stream flow, provide flexibility for variability, manage iteration, exploit uncertainty for new sources of value, control scope and reduce batch size, and shorten response time. Although these common lean engineering methods produce good results, a deeper understanding of the engineering value stream can help to clarify where some new more powerful lean engineering methods can be applied to deal with today’s business environment. The ‘Fuzzy Front End’ phase of the engineering value stream begins with the capture of stated and unstated customer needs and seeks to converge on an optimum conceptual solution. The execution phase takes the optimum conceptual solution and defines or specifies the design in a set of deliverable outputs for the operational value stream to build the product and service value streams to support the customer through the product life cycle. Engineering value stream steps can be aligned with these two phases. The distinction between the ‘Fuzzy Front End’ and the execution phase is critical because the nature of the engineering work in each determines what lean engineering methods are more appropriate to realize the benefits of the lean engineering delivery paradigm. The nature of the ‘Fuzzy Front End’ phase work is best described as non-routine, knowledge based work. The starting point is often a moving target because of changing customer preferences, customers may not know what they need, and markets are changing quickly. Work is subject to further risk and uncertainty because the best approach to satisfy the dynamic customer needs is not known. The novelty and complexity of the new product also drives risk. Introducing new technology also adds risk. Designing the optimum solution in the presence of risk and uncertainty involves creativity, experimentation, and alternative exploration. These factors influence the nature of the engineering tasks. Engineering tasks in the ‘Fuzzy Front End’ are highly variable, inherently unpredictable, non-repetitive, of non-homogenous task duration, with variable delay costs. Engineering work in this phase is often more customer ‘project like’ with a unique cluster of variable activities. Notwithstanding these challenges convergence on a design solution must meet cost, schedule, and quality requirements. There is a continuum of ‘Fuzzy Front End’ variability in which many firms or product lines may differ. At the low variability extreme some firms simply choose to imitate to constrain development risk although they can’t completely eliminate all risk from reverse engineering products. At the opposite extreme firms that seek breakthrough products experience very high variability. Firms can fall anywhere along this variability continuum between these two extremes. The nature of the execution stage on the other hand does lend itself more to principles of how lean manufacturing is applied because engineering work is more routine – detail drawings, testing, drawing release, shop query response, and customer query responses. The engineering execution phase has well-defined start and end points where task variability is much lower. Execution stage engineering work is procedural, scripted, and rule-based. Engineering tasks are predictable, repetitive, homogenous durations, and with homogenous delay costs. Managing for low process variance and repeatability is appropriate in this stage. Traditional lean methods are more effective in the execution phase. This also explains why lean implementation success is often reported for drawing processes or testing processes. The lean engineering framework also provides a good model for engineering leaders to evaluate if they have the right balance in their engineering delivery improvement plan. Failing to properly understand the nature of the ‘Fuzzy Front End’ phase of the engineering value stream will also lead to an overemphasis on execution improvements or an attempt to apply low process variance lean methods to high variability work that will not deliver good results. Although lean improvements to the execution phase will deliver cost reductions, faster cycle times, and improved quality the execution phase is completely dependent on the effectiveness of the ‘Fuzzy Front End’. This also applies to all the down-stream value streams including manufacturing, assembly, and service. The reason for this is that most of the life cycle costs are ‘baked into’ the selected conceptual design during the ‘Fuzzy Front End’ whether this is done intentionally or not. Therefore depending on where your firm sits on the development variability continuum the impact of improvements targeted on the ‘Fuzzy Front End’ could be very large compared with any savings from the execution phase. Engineering leaders should therefore bring a new perspective of their ‘Fuzzy Front End’ phase and determine if the return on investment from improvement efforts are targeting the right areas. The lean engineering framework helps engineering leaders to understand the lean engineering delivery paradigm to succeed in today’s business environment. Although not every lean engineering improvement method will be applicable to each firm the framework enables better improvement investment decision-making, ideas for improvement planning, less implementation frustration, and better outcomes. This entry was posted in Lean Engineering on July 24, 2013 by Andrew Reif.